This edited article about ship salvage first appeared in Look and Learn issue number 575 published on 20 January 1973. Thick fog had surrounded the 8,999-ton P. and O. liner “Egypt” all day, as she had made her way cautiously out of the English Channel. It was still with her as she rounded the French coast into the Atlantic. For hours now, the dull boom of the liner’s foghorns and the answering calls of other ships in the vicinity had grown so monotonous that most of the passengers had paid little attention to them. They were there to enjoy the voyage, and as they dressed for dinner most of them thought only of the pleasures of the evening ahead. But three men aboard the ship had a very good reason to be worried. The captain, the chief officer and the purser shared both a secret and a responsibility which made their steady glances into the fog-shrouded night doubly anxious. Only they knew that in the ship’s fireproof and thief-proof strongroom lay a cargo so valuable that its existence had to be kept a secret. Apart from the passengers’ jewellery and valuables, they carried some 2,318 gold and silver bars and a mass of gold sovereigns together valued at over a million pounds. These, the property of the British government, were destined for India and the Far East. But the three men were fated never to finish the fateful journey which had started at London on 20th May, 1922. While everyone was at dinner a dull, grinding thud shook the ship from stem to stern. 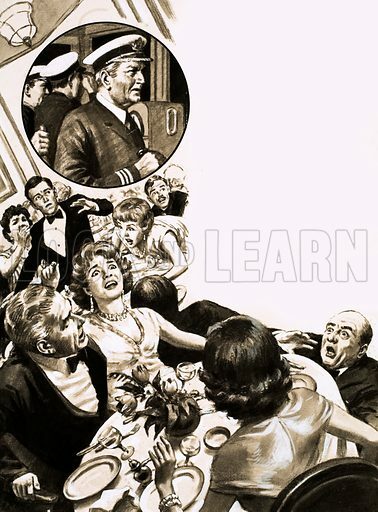 As tables overturned, crockery smashed, women screamed and alarm bells rang, it was obvious that the ship was already settling in the water, doomed to be sunk. She had been rammed by a French freighter, which had not seen her in the fog, and a huge hole in her stern had made everything but the abandonment of the ship impossible. One man, however, never gave up hope of finding a method of raising the treasure, despite the enormous difficulties. He was Peter Sandberg, a Swedish engineer who lived in England. First of all, however, the problem of the ship’s depth had to be overcome, for at that time divers could not go, deeper than 150 feet. What was needed was a cast-iron diving shell, strong enough to withstand the enormous water pressures. Fortunately, a German firm had developed a metal diving suit with flexible joints, and Sandberg planned to use this. After he had signed a contract with Lloyd’s of London to raise the “Egypt’s” gold, he found that another problem, just as difficult as the first, was in pinpointing the exact location of the wreck. Apart from the fog, the confusion on board had been so great that no one had thought of checking the position of the “Egypt” when it sank, and to search the sea bed over a very great area would be very difficult. Nevertheless, Peter Sandberg, with the help of an Italian company Sorima, started the search in 1929. By October, they had nothing to show for weeks of effort, and the storms which were becoming more and more frequent were making conditions extremely dangerous. Still Sandberg would not give up, and the following spring he started his search again. By this time, they were five miles away from the estimated position of the liner. Working under a hot August sun and with the knowledge that autumn would soon be round again, Sandberg and his men felt a depressing lack of enthusiasm as the salvage ships began yet another sweep of the area. But this one was to be different. The drag caught on an underwater obstruction and brought up a long curved shaft of rusty steel. Amid mounting excitement the crew watched, as a diving cylinder was lowered, to see once and for all if they had really discovered their elusive wreck. Alberto Bargellini, one of the divers, got into the special steel cylinder and was swiftly lowered into the black ocean. Willing hands manoeuvred the cylinder from above, as Bargellini described what he could see. “I can see something – it’s black and has a flat top – it’s a liner all right,” he said. He carefully described the superstructure. By now there was no doubt. Men on board the salvage ship were delighted; the “Egypt” had been found. Weeks of work were needed for a way to be cleared to the sunken ship’s strongroom. Explosive charges were laid, underwater floodlights set up and the painstaking task of completing the salvage operation safely continued slowly day by day. Soon it was obvious that the weather was becoming too bad for the real work of bringing up the bullion to continue. It would have to wait until the following spring. But at least the divers and the other men on board the salvage ship “Artiglio,” who returned to the French coast as winter set in, knew that the most difficult part of their job had been completed. To while away the winter months usefully, the “Artiglio” went to St. Nazaire to demolish a dangerous wreck in the port there. It was of an American munitions ship. Although it could only be demolished by being blasted with T.N.T. there was no reason to suppose that anything would go wrong. For three months, the crew of the “Artiglio” worked upon her, section by section, until, as Christmas approached, they tried to speed up the operation. The divers laid the charges and the ship, instead of standing off safely two miles, retreated only 300 yards. And instead of the usual muffled underwater explosion, there was a tremendous noise. The charge had exploded all the munitions on the sunken ship. A huge column of water shot into the air. This and the shock waves forced the “Artiglio” under water. At one moment she had been supervising a successful salvage operation. At the next, only a mushroom shaped cloud of smoke and spray marked where she had been. Only seven of her crew survived. A replacement ship was soon found and fitted out, but those who went to the wreck of the “Egypt” next year did so with heavy hearts. Yet another summer was spent in cutting the ship open in order for the strongroom to be reached, and it was not until June, 1932, that the grabs finally began to bite deep into the wreck’s treasure vault. It had taken four years of searching and intensive work. A ship had been lost, men perished and £80,000 spent in a desperate attempt to recover the “Egypt’s” gold. As the winches whirled men waited, silent and tense, to see what the grab would bring up from the sea. Slowly and ponderously the grab rose from the water, swung round and descended to the deck. The mechanic released the opening gear and a jumble of wreckage cascaded out. Among the wood and metal came the dull yellow glint for which they had waited so long. “Gold! Gold!” came the shouts from the delighted crew. There on the deck were seventeen gold bars – the nucleus of a fortune. After only three days work, the “Artiglio” set off for Portsmouth with over £180,000 on board. Everyone knew that this was only a start and that, as soon as the weather improved, they could return and set to work again in earnest. In fact it was over a year later before the operation was completed, but by then it had become the most successful modern treasure hunt of all. Virtually all the “Egypt’s” treasure had been recovered and well over a million pounds had been shared between Lloyd’s, the insurers, Sorima, the salvagers, and Peter Sandberg. It was Sandberg who had supplied all the ingredients for a successful treasure hunt – detailed planning, hard work, careful checking and a dash of inspiration. The success which followed was no more than his due.